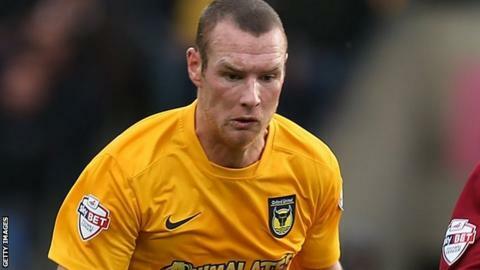 Oxford United boss Gary Waddock has warned James Constable he must decide sooner rather than later whether he wants to stay at the club. The 29-year-old, the club's top scorer for each of his six seasons at Oxford, was offered a new deal on Thursday. However, the striker is yet to accept the terms offered. "The decision is now with James. I'll need an answer pretty soon because I am not going to wait forever," Waddock told BBC Radio Oxford. Constable needs only one more goal to equal Graham Atkinson's club record 107 strikes for the U's. Constable joined Oxford in 2008-09 on loan from Shrewsbury and scored 26 goals. After joining them permanent the next summer he has gone on to score 106 goals in 280 games overall. "If he wants to be part of it then great, if he does not then I need to go out and look for something else," said Waddock. "The offer is there, he needs to weigh up if it is right for him. One way or other we need to know the answer." The Oxford manager, who took over in March, admitted the team needed rebuilding if they are to be capable of pushing for promotion next season. "It's a gradual process and transitional period," he added. "Part of the plan is to bring senior players in. It is not going to happen overnight as we need to be patient as other clubs will be talking to players. "It's not about rushing and taking the first player available. "I've got more meetings, it's non-stop but it is something I need to do to reshape and build a new squad." Meanwhile, defender Tom Newey has been offered a new contract by the club after the 31-year-old made 47 appearances for the U's last season. As well as Newey, three of United's youngsters have agreed their first professional contracts; Aidan Hawtin, James Roberts and Sam Humphreys.